Every car on the road has shock absorbers and the way they work is simple – they turn the kinetic energy of a car hitting a bump or pothole into heat which is then dissipated. So Zack Anderson and Shakeel Avadhany set to work. 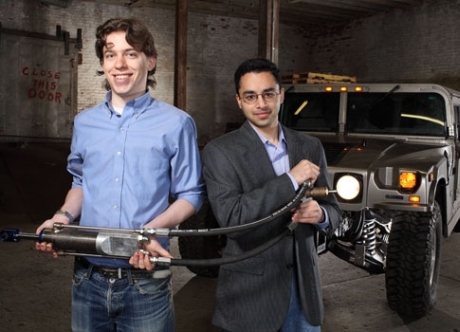 A few years down the line, a few rental car tests and torture later and those students are now graduates with a company based around the idea that every bounce absorbed by a shock could save energy and fuel. The solution they’re propositioning is called GenShock and according to them it can, depending on the road a vehicle is used, save anywhere between 1 and 6 percent of fuel used up. This project has caught attention of one of Detroit’s “Big Three”, the military, the haulage operators and other companies with large fleets of vehicles. AM General have actually sent a Hummer for testing with the new shocks which is now being checked for results and another prototype at MIT is undergoing various tests. The most important thing here is that this technology is a spot of innovation that has a genuine dose of reality, it’s effective, cheap, doesn’t imply new infrastructure and can be fitted easily to older makes of cars.